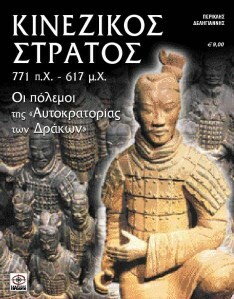 I have dealt with this ‘problem’ in brief in my book Ancient Chinese Armies (image below, published in Greek) and I will repeat here more briefly my view on it: I do not believe that the Chinese, Korean and Japanese troops used shields to a lesser degree than the ancient and medieval combatants of the Middle East, North Africa, Europe, Iran or India. Almost in their entire history, the Chinese and the Koreans had to fight peoples and tribes of skilful archers and horse-archers, mostly nomadic groups such as the Hu tribes, the Hsiung Nu, the Wu Huan, Hsien Pi, Juan Juan, Tu Κiueh, Mongols, Manchu, Dzungarians and many more other Tocharian, Turkic, Mongol and Tungus tribes. The armies of the Tai and Yueh (Viet) tribes in the south of the Chinese, and the Tibetans and the Chiang in the west of them were also manned by numerous archers. The Japanese had as well to fight the Jommon (culture), Emishi and Kumaso native tribes in their islands who also used the bow as their primary weapon. Finally, the armies of the Chinese kingdoms and principalities in their never-ending civil wars were also manned by numerous crossbowmen and archers. 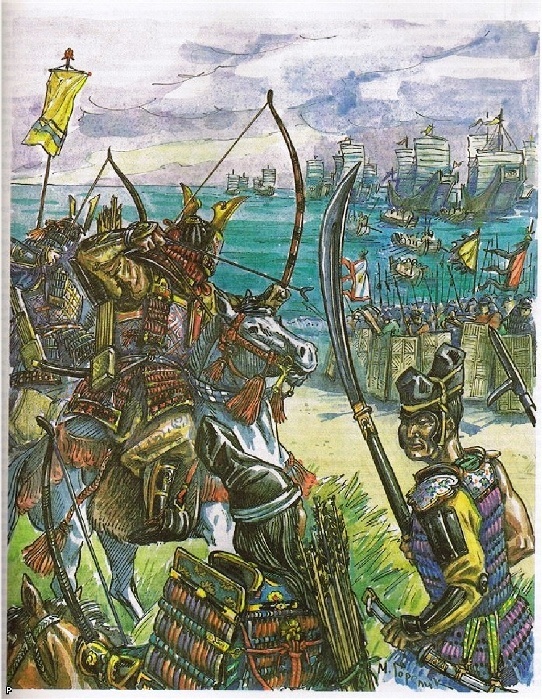 In some historical periods, the same was true (just for the archers) about the armies of the Korean kingdoms and the Japanese hegemonies and principalities but actually Korean warfare was mostly ‘static’ (wars were not decided in battles but mostly in sieges of cities) and Japanese warfare became more and more ‘heroic’ based on the Samurai tradition. 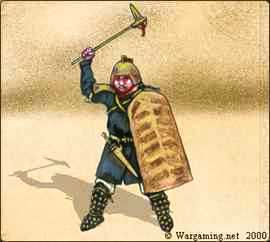 Thereby it is obvious that the combatants of these three nations needed shields possibly the most, compared to the combatants of the rest of Asia, Europe and North Africa. 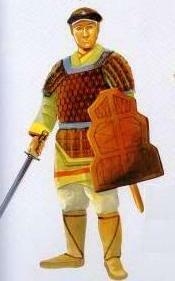 The outline of my view is that the Chinese and Korean, and the early Japanese combatants made reasonable use of shields and that the lack of evidence of them in the archaeological finds of the respective countries is due to the materials of which they were made of, mostly wood and leather. 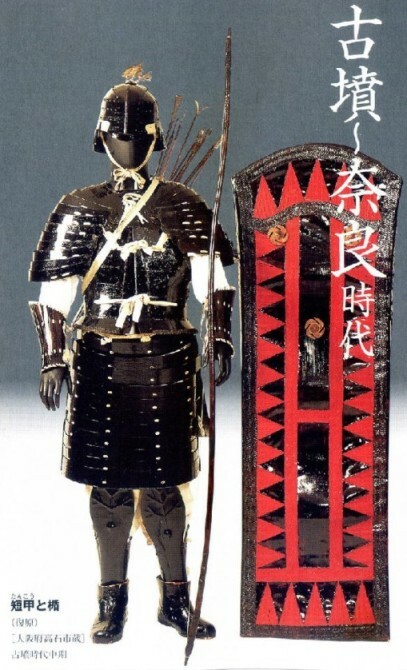 Until the modern times, the Chinese and Korean shields (the Japanese had already almost abandoned them due to Samurai warfare) were made mostly of these materials which of course, do not survive in the pass of time, and usually they did not have many metal parts (frames, handles etc) except some emblems and central buttons. 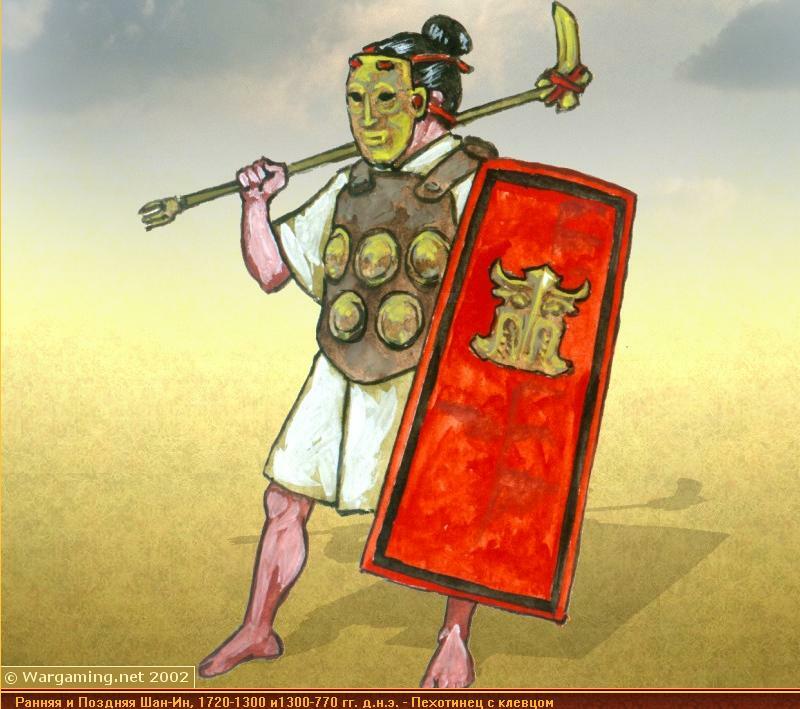 Concerning the limited presence of shields in the artistic depictions of any kind of the Chinese-Korean-Japanese cultures, my view is that this situation is due to the ‘heroic’ depictions of the warriors of the respective nations. There are some more arguments on this issue but I’m preparing a paper on it which I’ll publish in Academia.edu in the future. What follows is only a series of today’s reliable images of Chinese troops bearing shields from the Shang Dynasty Era up to the 19th century in order to demonstrate specifically the evolution of the Chinese shields. There are also a few examples of Korean and Japanese shields which are closely related to the Chinese ones, sometimes being almost identical with them. The Chinese influence on Korean warfare from the most ancient times is well known. 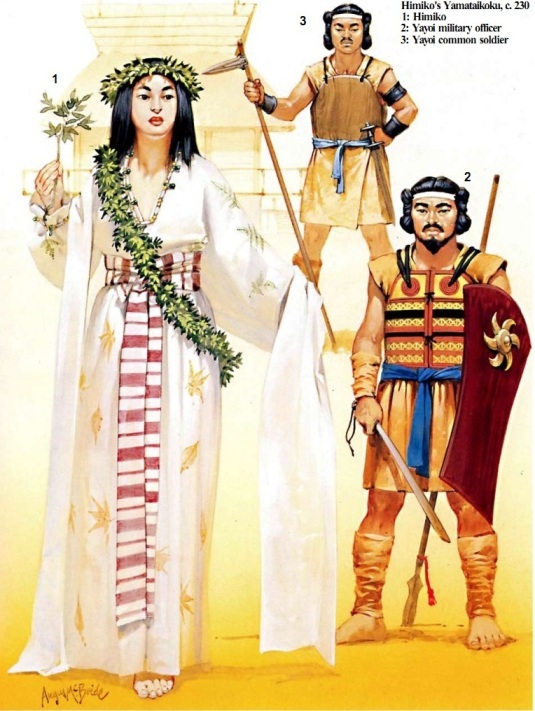 And taking into account that the Yayoi (culture) ancestors of the Japanese were mostly of Proto-Korean, Chinese and possibly Proto-Yueh origins we come to the same conclusion concerning their shields and generic warfare. 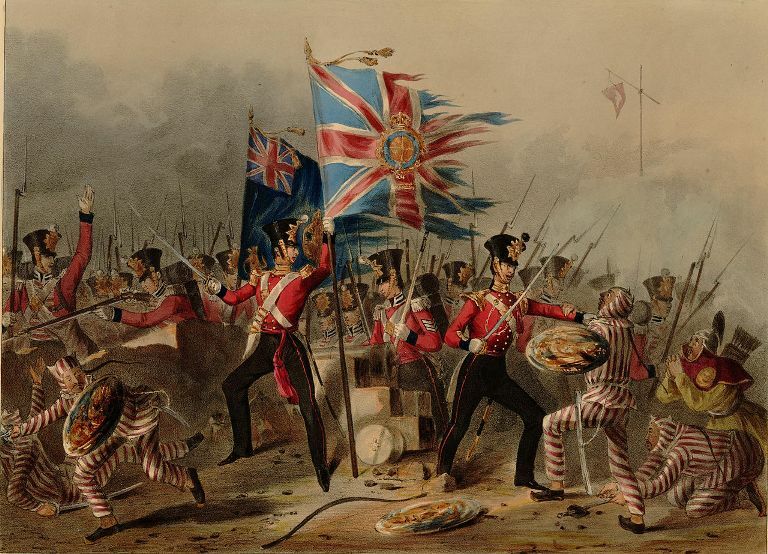 Additionally, the interactions in warfare between Japan, China and Korea had been permanent for millenniums. Most of the images that follow come from Wargaming.net (excellent work), Osprey publishing, Wikimedia commons, Tale Worlds (especially Matmohair: you’re doing a great job … my congrats), Zvezda and other sources. The images of this part (and parts II and III that will follow) depict shield bearing troops in order to demonstrate specifically the evolution of the Chinese shields (not in chronological order): a Shang Dynasty noble warrior, another Shang Dynasty warrior with a bronze mask, the 18th Royal Irish rgmt confronting Chinese ‘tigermen’ shield bearers at Amoy (19th cent), another Japanese example of a cuirassed early period warrior with a Chinese-type tower shield, a Spring and Autumn period Chinese warrior, a Han Dynasty Chinese swordsman, a Korean example that is Korean auxiliaries with tower shields (on the beach) confronting Japanese during the Mongol invasions of Japan (image and research by M. Gorelik) and finally a Ming Dynasty Chinese swordsman.